Birth By the Numbers is releasing a 4 slide update with recent data through 2017. These include total births, overall cesarean rates and cesarean rates by race/ethnicity. The decrease in cesarean rates was primarily driven by drops in non-Hispanic white mother’s rates. Download the PowerPoint file here . 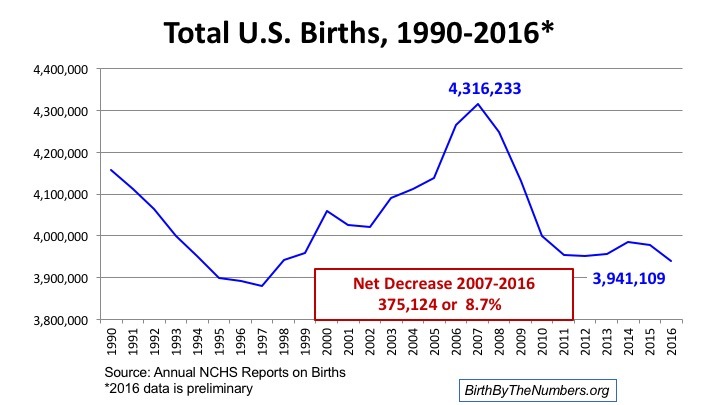 In conjunction with the release of the 2016 preliminary US birth data, Birth By the Numbers has released 4 new slides updating key trends through 2016. These include total births, overall cesarean rates and cesarean rates by race/ethnicity. 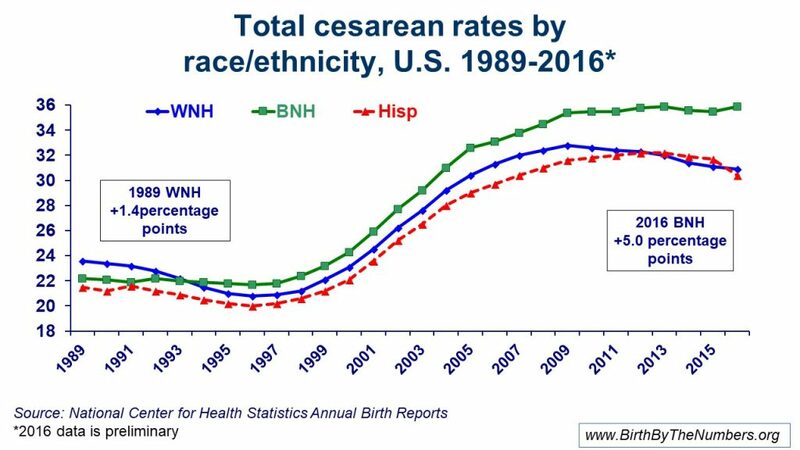 They show that the slight decline in the overall cesarean rate was driven by a notable decline in the non-Hispanic white rate, resulting in a growing disparity between the white and black cesarean rates in the U.S.
Each slide includes explanatory notes. They are free to use in classes and talks and we ask only that you credit them to Birth by the Numbers. Download the powerpoint slides here! Join Dr. Gene Declercq and the rest of the Birth by the Numbers team to explore how the United States is doing on a number of maternal and child health indicators. Are we doing better? Worse? Tune in to find out this answer and more! Helpful information for presenters is available in the notes section of each slide. Download the PowerPoint file here and PDF file here (Updated 3/02/2017). The general fertility rate in the U.S. decreased by 1% from 2015. The general fertility rate was 62.0 births per 1,000 women aged 15-44. The birth rate increased for mothers in their 30s and 40s and decreased for mothers aged <30. The cesarean delivery rate declined from 2015 to 31.9% of all births. This was the fourth year in a row that the cesarean delivery rate declined. The preterm birth rate increased slightly (2% increase) from 2015 to 9.85%. This is the second year in a row the preterm birth rate rose. The rate of low birthweight also increased by 1%. To find out more, click here for the full data brief. The general fertility rate in the U.S. decreased by 1% from 2015. The birth rate increased for mothers aged 30-44 and decreased for mothers aged <30. The cesarean delivery rate declined from 2015 to 31.9% of all births. The preterm birth rate increased slightly from 2015 to 9.85%. This is the second year in a row the preterm birth rate rose. The number of births in the United States slightly decreased by 1% from 2015. The teenage birth rate decreased 9% in 2016. The cesarean delivery rate declined to 31.9%. This is the fourth year in a row the cesarean birth rate decreased. The low-risk cesarean delivery rate decreased again to 25.7%. The preterm birth rate increased again to 9.84%. This is the second year in a row the preterm birth rate increased. The low birthweight rate increased again to 8.16%. This is the second year in a row the low birthweight rate increased. To find out more and for the full report, click here. In 2015, the teenage birth rate (females aged 15-19) declined by 8%. The birth rate was a record low for women in their 20s. The birth rate increased for women in their 30s and remained unchanged for women in their 40s. In 2015, the cesarean delivery rate decreased to 32.0% of all United States births. There was a decrease in cesarean delivery for all age groups and for non-Hispanic white and Hispanic women. The preterm birth rate in the United States increased to 9.63% in 2015. The low birthweight rate increased to 8.07%. To find out more, click here for the full report. The total births and general fertility rate increased 1% from 2013. The teenage birth rate decreased 9% from 2013. The mean age of mother at first birth increased to 26.3. The cesarean delivery rate decreased to 32.2% of all births in the United States. The preterm birth rate declined 9.57%. The low birthweight rate remained unchanged in 2014. Gene Declercq presented this at the Health Journalism 2017 in Orlando, Florida on April 21, 2017. Download the presentation here and view his talk here. Birth, death and contemporary media coverage in the U.S.
Gene Declercq spoke at the March of Moms in Washington, D.C. on May 14, 2017. Download the supporting data to his talk here.